One of the things I like about my weekly link review is that's it's always a bit unpredictable. So this week's list is much more eclectic and there isn't really a 'theme', well, that's not entirely true I guess. There are some interesting links 'working in development', e.g. getting 'hands-on' experience or the power of internal organizational referrals. There are also some interesting links dealing with the changing nature of academic reputation building, including Academia.edu's story and a new software to assess you 'impact' differently. But there are also many more interesting stories. Do check out Durham University's 'Writing on Writing' archive featuring short contributions from established social scientists on the nature of, well, writing in academia; and in case you are still stuck in a meeting, why not try out the 'DevCliche' bingo...and just as I was wrapping up the review Ed Carr posted a great new piece on the cultural shifts that are necessary for meaningful learning from failure. Kurante seeks to scale this emergent community of practice to facilitate transformative innovation through an inclusive sensitization training. We encourage you to collaborate with international development stakeholders and utilize indigenous libations to create a safe space where honest dialogue breaks through established norms and liberates innovation from existing power structures. 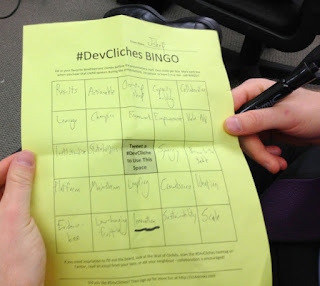 If any of that made sense, then you’re ready to deploy #DevCliches Bingo at your next donor coordination meeting to liven up the multi-stakeholder consultative process. I think this amazing game is pretty much self-explanatory ;)! Seminal People In Aid paper, The State of HR 2013 is now available to download via our website. An essential read for all those within the humanitarian and development sector, this year's paper focuses on the changing landscape in recessionary times and how this climate of uncertainty presents challenges to the sector. I'm always a bit skeptical when a consultancy company like Ernst & Young announces a 'trend' from which they and their business benefit, but this is still an interesting article. Question is: Is this or will this be a trend in the development industry, and if so, what are the implications for job seekers, especially those who want to enter the industry fresh from universities or other specialized places? I’ll say it again: Most aid, development and relief work is office work. Even in “the field”, the majority of the actual work that needs doing is around managing data and information and the flow of resources. This is the real “front line” “hands-on” work office work – just often in places where the offices aren’t as nice or where connectivity is poor or where it might be dangerous to walk outside. I won’t try to put a percentage on it, but as you consider a career in the aid world, you do need to understand that you will do a lot, if not mostly, if not almost exclusively office work. And while humanitarian aid and development can for many be an intensely rewarding career, I very strongly recommend that you adjust your expectations according to this reality. Talking about careers in the development industry: J. explains why 'hands-on' work in development often means 'hands-on laptop' work. So, a modest proposal for Bill Gates. Bill, please round up a bunch of venture capitalists. Not the nice socially-responsible ones (who could be dismissed as bleeding-heart lefties or something of the sort), the real red-in-tooth-and-claw types. Bring them over to DC, and parade out these enormously wealthy, successful (by economic standards, at least) people, and have them explain to Congress how they make their money. Have them explain how they got rich failing on eight investments out of ten, because the last two investments more than paid for the cost of the eight failures. Have them explain how failure is a key part of learning, of success, and how sometimes failure isn’t the fault of the investor or donor – sometimes it is just bad luck. You could start to bring about the culture change needed to make serious evaluation a reality. The problem is not that people don’t understand the need for serious evaluation – I honestly don’t know anyone making that argument. The problem is creating a space in which that can happen. This is what you should be doing with your annual letter, and with the clout that your foundation carries. Ed Carr on the cultural shifts that are necessary to create a climate of learning from failures in the aid industry. The involvement of former prisoners as actors in the processes of transforming the conflict at the micro or macro level in Northern Ireland exemplifies the complex interplay of the multi-levelled approaches and how they evolve over time. Given the time that has now elapsed since the Belfast/Good Friday Agreement, the next phase of peacebuilding or conflict transformation comes into focus. The predominance of former prisoners and their groups in specific spaces in Northern Ireland, particularly in interface areas of Belfast requires us to reconsider the nature of conflict transformation in these spaces. With the ageing former prisoner population and resulting reduction in the availability of individuals directly involved in the course of the conflict, a re-framing of conflict transformation in Northern Ireland is inevitable. Indeed, the truncation of the influence of former prisoners in conflict transformation will require individuals/communities within areas to engage with a peacebuilding narrative, not explicitly based in the conflict itself, but rather in the nascent peace in its wake. Despite the burst of negative press regarding corruption of charities in Afghanistan generated by Three Cups of Tea and author Greg Mortenson’s alleged financial mismanagement of the Central Asia Institute, the reality is that hundreds of courageous and tireless Afghan activists are continuing to lead civil society organizations (CSOs) and are pushing forward a burgeoning nonprofit sector in Afghanistan. Yet they face numerous challenges and limitations unique to the environment of Afghanistan, a nation struggling with conflict, extreme poverty, and extensive resource constraints. Despite the sometimes seemingly insurmountable hurdles, Afghan activists have met these obstacles with impressive ingenuity, passion, and dedication. The article reminded me that G4S and private security companies are a seriously under-researched topic in development research. G4S is a truly global company and I remember their logo in Kathmandu and the uniforms of 'guards' at private residences and offices of aid organizations. There was nothing dodgy in this, but there is an aspect of 'soft securitization' taking place in development that is rarely discussed. Manning essentially uses two frameworks to examine the international development blogosphere, that of public sphere and an “invisible college,” i.e. intellectual community. Like Tom, I think it’s useful to get an outsider’s perspective. I offer a few of my thoughts on Manning’s read and a challenge for the group as well. Jennifer Lentfer adds her comments to Ryann Manning's paper on development blogging that I briefly highlighted last week. Life is more competitive, more difficult for the younger generation. We were poor, but we did not have an incredible sense of anxiety about climbing ladders, of achieving certain kinds proficiency, nor did we face the pressure of “self-branding.” Those pressures did not exist in our particular generation. It was much more the case that you could build a solid career, work with others in a team, and fulfill your role in your department. You had to work hard, but the stress was about whether I slept 4 or 6 hours, not whether or not one had created a unique profile to draw attention to oneself. I was hugely fortunate to raise kids in the 1970s, when we still had the 1960s ethic of helping each other. We were in babysitting and nursery co-ops run by the parents. I had to work one morning a week at our oldest child’s coop nursery school, and ran the accounts of an after-school program for the others. It seems a bit unfair maybe to extract a quote from this long and detailed interview with Jane Guyer that is not related to her research in Africa, but I got bis nostalgic about those 'good old days' without self-branding and impact factors...;)! This week, the photo collective Everyday Africa, a project focussing on images of daily life in Africa, will be posting to The New Yorker’s Instagram feed. Nine photographers across the continent, from Mali to Kenya, are contributing. We have written to a number of scholars who have made a significant contribution to the social science literature and asked them to write a short piece (500 to 1,500 words) offering their personal reflections on the process of writing. In these pieces, scholars from a variety of social science disciplines share their thoughts, feelings, pearls of wisdom, anecdotes, theoretical musings and much else likely to give insight and inspiration to those in the later stages of doctoral writing. Wow. If you only choose to click on three links in this week's review make this one of them! There are some true gems hidden on this slightly old-fashioned university website. Writing isn't a gift or talent, it's a skill which can be gained. Want a lean muscular body? - eat less, work out. Want a lean muscular mind? - work the damn thing! work it hard! And it's not a life and death matter, so forget the histrionics that sometimes lead otherwise perfectly sensible people to behave like characters from second rate operas, and get on with practising it. Those five hours each working day were incredibly productive for my friend (who is not fictitious), even though they may not seem to add up to ‘a lot of time'. But she did it purposefully and in an orderly, structured and planned way. No endless looking at websites, no going off for cups of coffee, no everlasting chats about this and that, no pathos of an ‘I can't do it' kind, just focused attention on the matter in hand and practising the craft. I started to listen to it over lunch, and it sounds quite fascinating for those who are interested in 'academic blogging'. In this video, Price and I discuss the genesis of the site, what they’ve been doing to help architect their system, and the overall state of how academic papers are kept within the realm of academic journals, which he believes slows down the pace of discovery and innovation in science and technology. This dynamic enables the journal industry to acquire the intellectual property for the entire world’s scientific output for free, and charge the scientific community and the general public $8 billion a year to get access to it. To get out of this mess, we need to build new reputation metrics, ones that don’t incentivize scientists to put their work behind paywalls. Ironically scientists would vastly prefer to have their work open access. It is just that the system of reputation metrics that has emerged in science doesn’t allow them to do it. Building a new system of reputation metrics is one of the most important things that Academia.edu is doing. It seems that Academia.edu has been gaining more momentum recently and is more actively pursuing its goals around access to information and cutting-edge research. On a side-note: You are most welcome to connect with me on Academia.edu! Furthermore, the research review process can be very exclusive and protectionist, while the very public nature of journalism ensures that many different individuals and groups consider it and evaluate it at different levels and constituencies. They work because they combine thorough academic research with sound journalism like good writing and design – in other words, the kind of journalism that is appropriate for academic content.